UW-2(a)(1)(b), Interpretation VIII-1-92-211: Slip-on flanges and Figure UW-13.2 details are not allowed. Appendix 2-5(d), Equation (3): Maximum bolt spacing. Appendix 2-6, Equation (7): Bolt spacing correction factor. 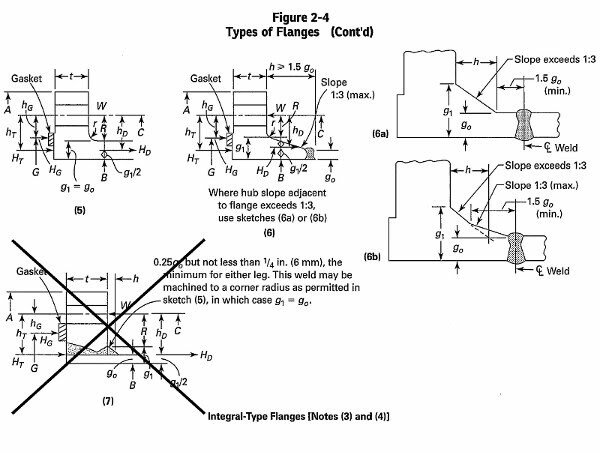 Appendix 2-14(a): Flange rigidity calculations are mandatory. Interpretation VIII-1-95-138: Type 7 shown above is not allowed.